I took advantage of the free setup special on Djangobooks and ordered me an M01 and it arrived yesterday! It's beautiful, but I'm curious. Aside from some action issues likely caused by the change in climate from Seattle to Atlanta (left the shop at 2.8mm 12th low E, and can now fit two 2.0mm picks upon arrival) which I'll probably have to remedy myself with some humidity management and bridge modification, I noticed a gap between the bridge and the lower mustache (almost able to fit one of those 2mm picks) that is not present on the upper side (where the gap is closed). The guys told me this is nothing to worry about which is true because it is only cosmetic, but has anyone seen this before? Is this just a product of a lower-end Asian made guitar? It just looks strange with the mustache floating out in space like that. Note: Michael and Josh are in the loop on all of this and have been very responsive via email with my questions. When looking at the strings, do they appear centered over the fret board? In other words, are the high E and low E approximately the same distance from the edge of the neck? It's possible that it was jarred in shipment such that the bridge shifted down towards the treble side bout. It also appears that the high E popped out of its notch in the bridge and shifted "outward." The strings are centered. Per Josh, the bridge was improperly notched from the factory so there are some extra shallow notches in the bridge but the strings are now where they need to be. It was very well packaged so I doubt it shifted during transit. I appreciate the input Andrew! Well it is one thing to say these are budget Asian made instruments and charge extra for a decent set up, but that just looks like faulty goods to me, are all Altamiras this shoddy? shouldn't make the slightest difference in tone, playability ( unless the bridge isn't centered) or stability of the instrument. 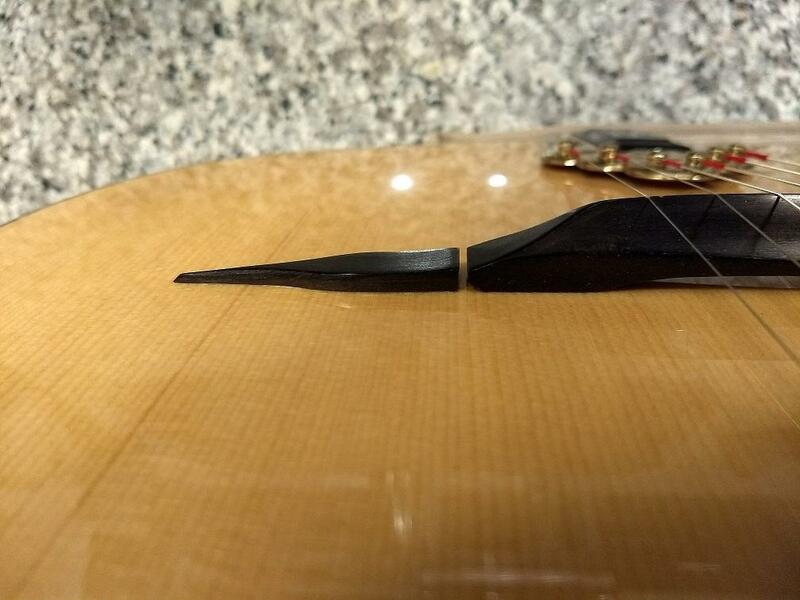 I've played alot of guitars where the bridge wasn't super tight against the moustache pieces; it's probably better to have a little breathing room anyway. Having a bit of space is a good thing if the top goes up and down with humidity and temperatures. Too tight and the moustache might pop off if the top lowers a bit. Although it would be nice cosmetically if it was centered. Yeah it really makes no difference. I don't even use moustaches but I would not have them tight up against the bridge anyway. I am Asian-made and I am with the highest quality. 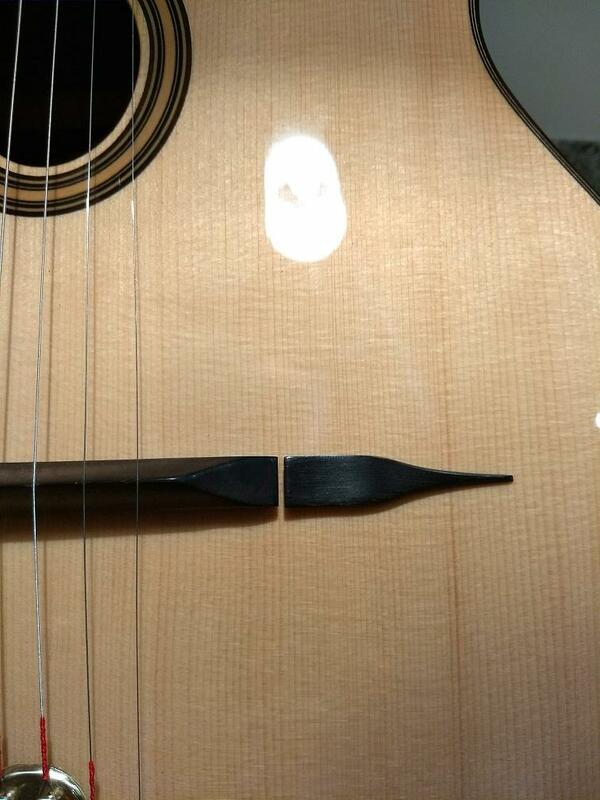 I remembered the first time I changed the strings myself and when I loosened the strings the bridge fell over. That's when I realized that the bridge was not glued to the wood. So, loosen the strings and center the bridge. Should be no big deal. Haha, yeah it's a 'little' more complicated than that. 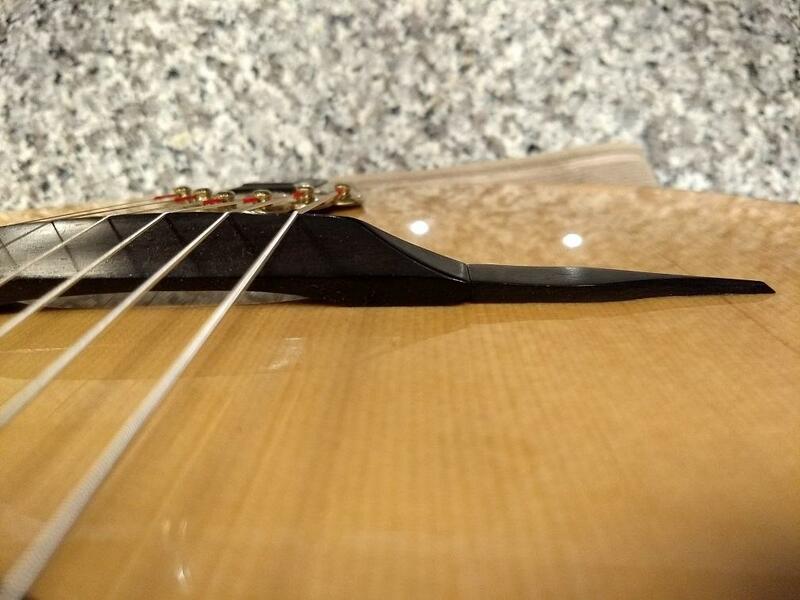 If the distance from the OUTSIDE edge of the low and high E strings are the same distance from the edge of the fretboard then you don't want to move the bridge otherwise you will need to do the whole bridge setup over.